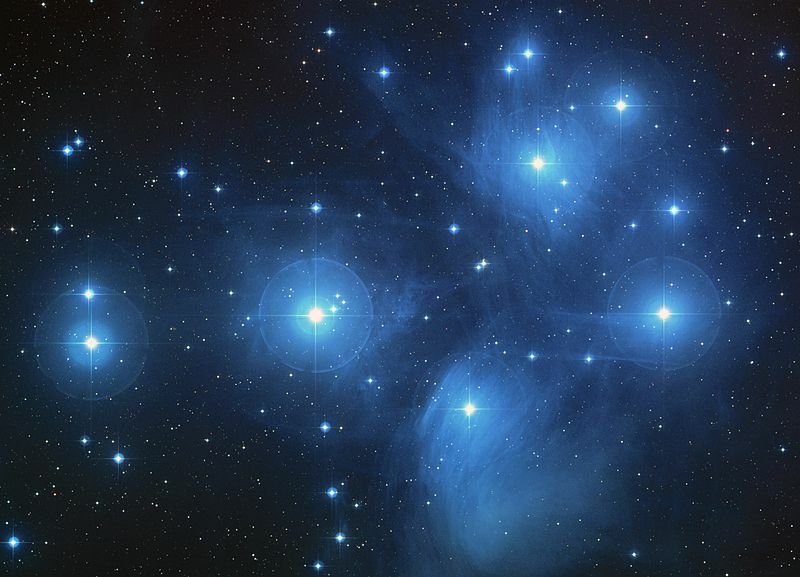 Today, the name of the Pleiades is perhaps best known as a cluster of stars in the night’s sky, making up part of the Taurus constellation; these seven stars though, are named after seven sisters, the Pleiades of Greek mythology. 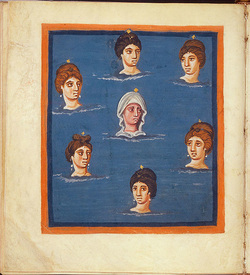 Writers in antiquity would talk of seven Pleiades, mountain nymphs, though to inhabit Ancient Greece. The seven Pleiades were the daughters of the Titan Atlas; and where a mother is named, they were the offspring of the Oceanid Pleione. Atlas was well-known for his beautiful offspring, and so the Pleiades were sisters to the Hesperides, the Hyades, and Hyas. The names of the seven Pleiades was general agreed up by ancient sources, with the seven sisters being; Maia, Electra, Taygete, Alcyone, Celaeno, Sterope, and Merope. In Ancient Greece, the role of the Pleiades was that of companions and attendants to the goddess of the hunt, Artemis. The seven Pleiades were also though thought of as nursemaids and teachers to the young Dionysus. As companions to Artemis, the Pleiades also came into contact with the male Olympian gods, and whilst their father, Atlas, was in disgrace, and enduring eternal punishment, the seven sisters were very much in favour with the likes of Zeus, Poseidon and Ares. The leader of the Pleiades was said to have been Maia, who was also the eldest of the Pleiades. Maia is of course the most famous of the sisters, with the month of May named in her honour. Maia was also considered to be the most beautiful of the Pleiades, and so it was perhaps only right that Zeus chased her. The god though, did not give the mountain nymph a chance to spurn his advances, and he lay with her whilst she slept; this lead to Maia giving birth to the god Hermes in a cave on Mount Cyllene. Hermes would famous leave the cave as a newborn to steal away the cattle of his half-brother Apollo. The maternal nature of Maia is also displayed by the fact that Zeus gave over care of Arcas to the nymph, when his mother, Callisto, had been transformed into a bear. Zeus though, was not just satisfied with having one Pleiades, and would chase a second, Electra, despite the nymph being the wife of an Italian king, Corythus. The union would bring forth two sons, Iasion a companion of Demeter, and Dardanus. Dardanus would famously be a survivor of the Deluge, and would found a new city, Dardanus, and a new region, Dardania, in Asia Minor. His family line would also bring forth the Trojans. Zeus continued to make his way through the seven Pleiades, this time sleeping with Taygete. Taygete would attempt to run away from the advances of the god, and asked Artemis to transform her into a deer to make this happen. The transformation though, occurred too late, as Taygete was already pregnant. The Pleiad was already pregnant with Lacedaemon, the first king of the state known as Sparta. Zeus was not the only Olympian who lusted after the Pleiades, and Zeus’ brother Poseidon would mate with Alcyone. The relationship would bring forth a daughter, Aethusa, and two sons, Hyrieus and Hyperenor. A second Pleiades also fell to Poseidon, with twos sons being born to Celaeno. One son was Lycus, who became a king of Thebes, and Eurypylus, a king of Cyrene. The pair though are more famous in some stories, as Poseidon would give them the exalted position as rulers of the Fortunate Islands, the kingdom of the Blessed in the Greek afterlife. The Olympian god Ares would also have his way with a Pleiad, as the sixth sister Sterope, and a son, Oenomaus was born. Oenomaus was father to Hippodamia, and therefore ancestor to the likes of Agamemnon and Orestes. The last of the Pleiades was Merope, and she was one of the mountain nymphs who escaped the attention of the gods, and instead happily married a mortal. This mortal though was the infamous Sisyphus, and Merope would bear him several sons, including Glaucus and Almus. It was not just the male gods of Mount Olympus who were enamoured with the beauty of the Pleiades, and the gigantic hunter Orion also lusted after the attendants of Artemis. Orion felt confident in the chase of the seven sisters as their father was in no position to protect them; Atlas having the weight of the heavens resting on his shoulders. Artemis had not happy about the ravaging of her attendants by her own family members, and certainly did not wish Orion to do likewise. So, Artemis sought the assistance of Zeus, and the supreme god would therefore change the seven Pleiades into doves. Orion though, was a great hunter, and managed to track the seven sisters down, so Zeus instead transformed them into seven stars instead. Even then, Orion, as the constellation Orion, still tracks the Pleiades across the night’s sky. In some versions of the myths, the Pleiades were transformed after they had committed suicide; the suicide being brought on by the news of the deaths of the Hyades and Hyas. In the night sky only six of the seven Pleiades can be clearly seen by the naked eye. The seventh star is said to be either Merope, dimmed because of the shame of consorting with a mortal, or Electra, dimmed because she was distraught at the demise of the Trojan people, her descendents.